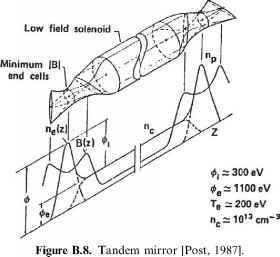 The idea behind the tandem mirror (TM) is to modify the electrostatic potential shape along B in such a way as to confine both escaping ions and electrons. In the tandem mirror (Figure B.8) two smaller mirror cells are added at each end of the larger central cell where fusion reactions are supposed to take place. The axial profiles of density and temperature in the two end cells are tailored, using external methods such as radiofrequency heating and neutral beam injection, so as to transform them into positive potential electrostatic "plugs", thus reducing the loss of positive ions from the central cell. The axial profiles of density, temperature, and electrostatic potential are shown in Figure B.9. comparison between density and electrostatic potential profile in a standard tandem mirror and in a tandem mirror with a thermal barrier. — the conventional TM scheme, in which higher potential in the plug cells is achieved by increasing the plug density with respect to the central cell density; such an increase is obtained by energetic ion injection in the plug; the magnetic field, density, and plasma potential axial variations are shown in Figure B.9; since the density in the central cell must be sufficiently high to reach large fusion density (Pfus / n2), very high values of plug density are in order, and this implies a very high magnetic field («15 T) in the end cells and high-energy neutral beam injection (E « l MeV). Note that in this configuration electrons are reflected at the end of the two plug cells, therefore electrons in the plug are in thermal contact with electrons in the central cell: any attempt to increase the temperature in the plug will increase the temperature in the central cell as well, and therefore will increase power demand; — the thermal barrier TM scheme, in which electrons are reflected before reaching the central cell. This scheme thermally insulates the (hot) electrons in the plug from the (colder) electrons in the central cell, so power must be used to heat only the former. 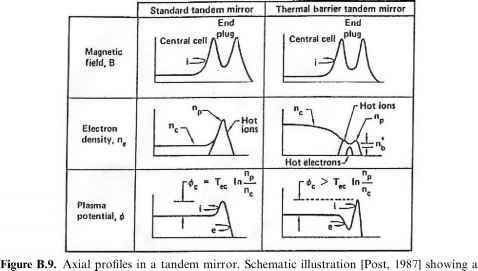 If a thermal barrier is established, the plug electron temperature can be kept at a higher value than the central cell temperature, and high electrostatic potential can be achieved in the plug to confine the ions. In order to establish the barrier, the ions are removed in the thermal barrier region by charge exchange with a neutral beam injected almost parallel to B: the negative charge difference creates the electrostatic potential hump (the barrier). The second scheme is more practical, since it puts less stringent conditions on the engineering parameters (magnetic field and injected ion energy) of the two end plugs. It is apparent that, in order to maintain this configuration, external power must be injected in the two end cells. On the other hand, if the volume of the end cells is sufficiently smaller than the volume of the central cell, the contribution to the global energy balance of the end cells is negligible, and large Q becomes feasible. This has been experimentally shown in the first generation of TM experiments (e.g., TMX at Livermore, see [Post, 1987] for details) where ion and electron confinement was enhanced by an order of magnitude. However, it is already apparent from Figure B.9 that to maintain the desired shape of the electrostatic potential requires very sophisticated tools that must work over the relevant range of parameters and especially at high density (to achieve high fusion power). particle orbit width, can significantly increase the stability threshold (note that in the old tandem mirror 2XIIB experiment, fl values larger than 200% were achieved in regimes with large-particle orbits). In summary, fl values above 20% might be achieved by TM. The possibility of an MHD-stable central cell without the superposition of a multipolar field has the important consequence of reducing radial transport. In conventional mirrors radial transport is negligible with respect to axial transport, but becomes significant in tandem mirrors due to the enhancement of axial transport by the plugging potential. Note that there is an important difference between radial transport in mirrors and in toroidal systems. In the latter radial transport is forced to be ambipolar: any mechanism that enhances the loss rate of one species produces a situation where the loss rate of the other species is also enhanced. This is not the case in mirrors: since there are two loss channels (axial and radial losses), radial ion losses can be balanced, for instance, by axial electron losses, without the need to increase cross-field electron diffusion. This observation is the basis for the control of radial transport through the end-plate potential: radial transport is influenced by the radial electric field; electrons lost by axial transport are collected on a plate that tends to become charged negatively, driving the plasma to a negative potential as well; then by inserting a variable resistance between the end plate and the wall, it is possible to act on the potential difference between the plasma and the wall, reducing the radial electric field and radial transport. — the GAMMA-10 device at Tsukuba (still in operation), has an axisymmetric central cell (in order to minimize radial transport), stabilized by quadrupolar magnetic wells coupled to the central cell by "axisymmetrizer" transition coils (Figure B.10). Outside of these "anchor" cells there are axisymmetric mirror cells where the thermal barrier and the plugging potential are generated (e.g., see [Cho et al., 2004]). 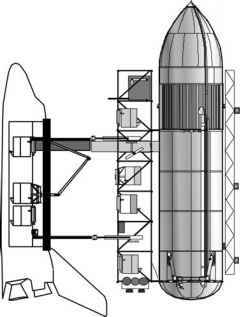 GAMMA-10 has an axial length of 27m; the total volume of the vacuum vessel is 150 m3. The central cell has a length of 6 m and a fixed limiter with a diameter of 0.36 m; magnetic field intensity Bm at the midplane is 0.405 T with a mirror ratio R = 5.2. Ion-cyclotron heating (ICH) (200 kW at 4.47 MHz or 6.36 MHz, as well as 100 kW at 9.9 MHz or 10.3 MHz) are employed for the central cell hot-ion production and anchor stabilization, respectively. The axi-symmetric end cells have an axial length of 2.5 m (Bm = 0.497 T, and Rm = 6.2). Figure B.10. Schematic view of the GAMMA 10 tandem mirror (from [Cho et al., 2004]); (a) magnetic coil set; (b) magnetic flux tube with heating systems; and (c) axial magnetic field (dashed curve) and potential profiles (solid curve). about the stabilizing effects of a population of "sloshing ions'' produced by oblique injection of neutral beams. — The TARA experiment at MIT, aimed at testing the possible use of axisymmetric central and plug cells (in order to reduce radial transport) with MHD stabilization provided by two quadrupolar anchor cells located at each end, outside the region where plugging occurs. Research is also being carried out at present on the AMBAL M device at the Budker Institute in Novosibirsk and on the HANBIT device in Korea. The large MFTF-B tandem mirror facility at Livermore was mothballed right after the test of the various systems in 1986, due to budgetary constraints. — the possibility of suppressing high-frequency micro-instabilities due to sloshing ions and trapped warm plasma. Encouraging as this may sound, extrapolation of these results to plasma an order of magnitude larger in density and potential is still questionable. When compared with fusion reactors (taking central cell parameters), the present results still need substantial scaling both in terms of p* (by about a factor of 10) and in ft (a factor of 5), whereas the values of the collisionality parameter v* would be similar to those obtained in present devices.